Ford delivered its first ‘pony car’, the Mustang, in 1964 but it wasn’t until late 1969 that Chrysler released its E-Body cars, badged Dodge Challenger and Plymouth Barracuda. The Barracuda name had existed since 1964 but the 1970-74 cars were much different to earlier Valiant-based models. producing 294kW. The 5.5-litre AAR (All American Racing) ’Cuda – available only during 1970 – highlighted Dan Gurney’s competition ’Cudas, which unsuccessfully contested the Trans-Am series. Convertibles were short-lived and sales were dismal. Convertible ’Cudas with Hemis or 440s are among the rarest US muscle cars, with fewer than 20 of some variations built. The Gran was a muscle car for the mature driver and its base price included leather seat trim, overhead console and stainless body mouldings. A six and three-speed manual ’box were standard but only 210 were sold in 1970 – almost 8000 were sold with V8s. Incredibly, for a car capable of 225km/h, discs were optional on all but the AAR, and air-con wasn’t available on Hemis or 440-6s because there wasn’t room under the bonnet! Convertibles were canned after ’71 and following poor sales and legislative changes, the ’72 range was slashed to ‘base’ and ’Cuda only, with almost all 16,100 cars built as V8s. The quad-light front and Shaker were deleted, but unassisted front discs became standard. New ‘5mph impact’ bumpers were installed for 1973, by which time 5.2- and 5.6-litre V8s were the only choices – detuned to run on unleaded. By 1974, when the model died, the ‘range’ had been reduced to one version with the 5.9-litre ‘boat anchor’ developing 182kW. 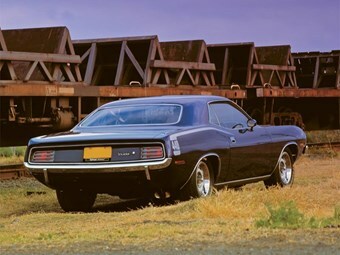 The majority of Barracudas used Chrysler’s 5.2-litre and 6.3-litre V8s and three-speed automatic. In auto form, the 383 cars barely managed 0-60mph in under nine seconds – for performance, a 340 or 440 manual was the way to go. A 440-6 ’Cuda manual romped through 0-400m in 13.7sec, but this is only 0.5sec quicker than a 340-engined car. Power steering is uncommon in small-block cars but handy in the big-engined cars as endemic understeer creates considerable steering loads. Hurst shifters make manual gear selection with the auto easy but power brake-assist was, incredibly, an option on most early models. Even big-block cars didn’t always come with LSDs. Bucket seats will be fitted to the majority and look okay in Gran-spec leather, but there is little support. The dash is well-supplied but ’Cuda interiors are generally fairly plain. Look for repairs to the firewall and rust on the floor, under vinyl roofs or chassis. Engines are bulletproof but heat is the enemy of big-blocks so check the cooling system. Auto ’boxes are tough but don’t last forever. Check for front suspension damage and cracked rear springs. Disc rotors wear quickly. Virtually all interior parts are available new or reproduction.